I felt the need to introduce this nutbag to you all; please remember the name Michele Bachmann. She is a Republican Representative from Minnesota and she is borderline nuts!!!! She is the perfect example of insanity on the Right that will hold this country back. Her ideas of what are “Big Government” ways of intrusion into our personal lives are so far Right she might be on an island by herself. 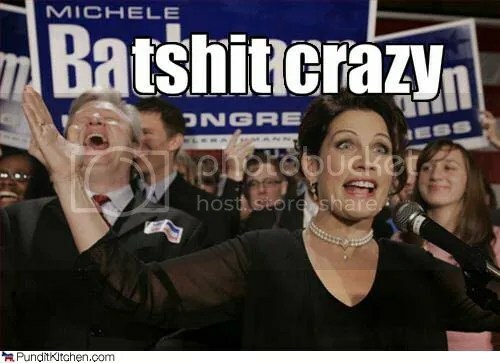 We have to watch out for people like Bachmann, she is the type of person that would tell you that the government has planted microchips in us to track our every movement, LOL! Seriously this broad is out there, where should I begin???? The lunacy doesn’t stop there, in June 2009 Bachmann talked about her concern about the upcoming Census in 2010. It seems as if her fears of big government hit an all-time high as she feared the Census was “very intricate, very personal”, and that, “the only question we will be answering is how many people are in our home, we won’t be answering any information beyond that, because the Constitution doesn’t require any information beyond that.”. That’s right folks watch out for the big bad Census, WTH!!! What respectable member of Congress acts this way???? She would rather people follow her nutbag ways than ensure her constituents were accounted for and received proper representation. This is the insanity that is driving the extreme Right-Wing part of the Republican Party and the Tea Baggers of the Tea Party Movement. I know there are smart people in Minnesota, how is this nutbag still in office? It’s time to Takeover Michele Bachmann’s seat in the House of Representatives; someone please dumped this psycho in Lake Minnetonka!